Willard’s sous-chef Lalit Kumar has shuttled around the world. WASHINGTON, DC: One of the famous landmarks in all of Washington, DC, is also one that is often overlooked – the Willard Intercontinental Hotel. Situated mere walking distance from the White House, the original structure of the hotel was built in 1816, nearly 200 years ago. Since then, it has grown both in size and prestige, playing host to everyone from Hollywood celebrities to foreign dignitaries, and even US presidents. Located within the Willard is the Café du Parc, a French restaurant that is considered one of the best of its kind in the nation’s capital. And the most unusual thing about this restaurant is that its sous-chef – the second-in-command of a kitchen who occupies the duties of the executive chef when he or she is unable to – is an Indian: Lalit Kumar. Kumar was born and brought up in New Delhi, where an appreciation and inquisitiveness about culinary arts was instilled in him at an early age, and the desire to become a chef. “Delhi is a very rich city. Most of the cultures of India come together there because it is the capital, so it’s very foodie. You walk on the street somewhere and you can get all kinds of different foods. So growing up in that kind of environment steered me towards becoming a chef,” he said in an interview to The American Bazaar. After graduating from the Institute of Hotel Management, in Shillong, in 2007, he received a scholarship to do his Masters in International Hospitality Administration in Nimes, France. “I went all the way from Shillong to the south of France,” Kumar recollected. “I was doing my Masters there, and side-by-side I was also working in a French pastry shop,” a skill that would prove to be vital to Kumar’s culinary arsenal during his career. From there, Kumar went to the French Alps, working at a two-star Michelin restaurant in the Relais & Chateaux, a world-renowned luxury hotel. “Two-star Michelin means [the] second-highest rating in terms of quality of food,” explained Kumar, who spent two seasons at the Relais & Chateaux before moving on. Kumar’s next job took him to New Orleans, a place that is highly influenced by French culture but still presented quite a challenge. 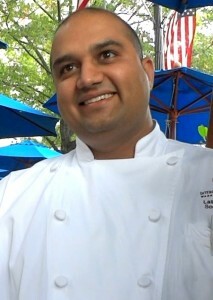 After his time in Dubai, Kumar came back to New Orleans in 2012, where he became a sous-chef at the Intercontinental Hotel there. He spent a year in New Orleans, learning the ropes of his new position, before coming to the Willard in February of this year. But after working in all sorts of exotic places like southern France and Dubai, why come to Washington, DC? Although Kumar officially works for Café du Parc, he does a lot of banquet work for the Willard Hotel itself. When dignitaries and celebrities stay at the Willard, Kumar is often called upon to put his encyclopedic culinary knowledge to use in the kitchen, helping to keep the Willard’s sterling food reputation intact. April through November is typically the busiest time at Café du Parc, which receives an enormous number of guests on a daily basis. “We get about 200 [patrons] for breakfast, 150 for lunch, and 120 for dinner. But we also serve an afternoon menu, which is after lunch but before dinner, and that’s usually about 80. So that’s like 450-500 every day,” he said. At such a young age, Kumar has already come far in life, having already served the likes of Sachin Pilot, Ban Ki-Moon and George Clooney, among others. Kumar also got married last year, with his one-year anniversary coming up in November. Kumar says he’s happy where he is, and wants to continue on at the Willard for the next several years before deciding what to do next, keeping open the possibility of one day opening his own restaurant.